This three part documentary explores the ugly, tragic and above all profitable history of the African slave trade. The profound grief, anger and shame I experienced on watching it was compounded by having to wait until age 70 to learn this stuff. This is a history all American and European children should learn by heart in primary and secondary school. Part 1 focuses around the 15th century European slave market, which was mainly run by the Portuguese. Prior to the fall of Constantinople (to the Turks) in 1453, Europeans sourced their slaves (derived from the word “slav”) from the Balkans. Following the collapse of the Slavic slave trade, during the 15-17th century the Portuguese kidnapped more than one million Africans were kidnapped for sale in Spain, Italy and Southern France. They were put to work in agriculture, iron works, sailing, fishing and pottery production. Most archeological traces of Lisbon slave trade were destroyed in the Great Lisbon Earthquake in 1755. In Europe, African slaves were assimilated into European families and communities and many Mediterranean families carry African DNA. The Portuguese also established a profitable trading relationship with the powerful King of Konga, who converted to Christianity and traded African gold for modern European goods for his nobles. In addition to transporting the slaves they captured to Europe, the Portuguese put them to work in the Elmina gold mines in modern day Ghana and on the first sugar plantations on Sao Tomean Island in the Gulf of Guinea. A series of successful slave uprisings caused the collapse of the Sao Tomean plantations. At this point, the Portuguese began transporting their African slaves to new sugar plantations in Brazil. This book centers around something global economists refer to as the “Dutch curse.” In 1959, the discovery of oil in the Netherlands led to massive unemployment outside the oil industry. A big increase in dollars generated by oil exports caused major inflation in the local currency. This made imports cheaper than locally produced goods, shutting down hundreds of Dutch businesses and putting thousands out of work. Although multinationals pay far less than market value for oil, gas and precious minerals, they pay corrupt puppet dictators enough that they don’t need to tax their citizens. Burgis maintains this absence of taxation results in a lack of accountability to their citizenry. Instead of holding leaders to account for their failure to provide basic infrastructure, citizens of “resource states” are far more likely to angle for their share of the loot. Retaining power becomes a simple matter of maintain elaborate patronage (payoff) systems and harsh military/security networks. Burgis also refutes the myth that Africa’s multiple civil wars stem from tribal and religious conflict. Most African wars are pure resource wars (often triggered by CIA and French and British intelligence), with the conflict used as a cover for resource smuggling and even lower net cost to multinationals. The US government has attempted to crack down on its own corporations via stricter enforcement (since 2000) of the 1977 Foreign Corrupt Practices Act and a section of the 2010 Dodd Frank Act that prohibits the the purchase of Coltan* from armed rebel groups. The new law, which has done little to reduce Coltan smuggling, has opened the door to a Chinese monopoly on the Coltan market. 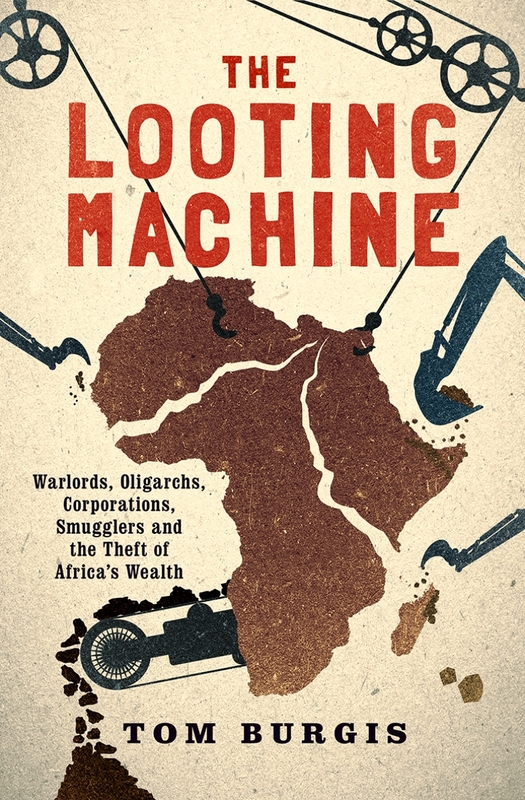 The Looting Machine presents a detailed country by country analysis, as well as an examination of the Chinese company responsible for most private investment in Africa (there’s less publicly available information about investment by state-owned Chinese companies). Both engage in far more infrastructure development than Western agents do. Angola – principle export oil, with 70% of oil ventures owned by Hong Kong billionaire Sam Pa, operating as Queensway Group or Chinese International Fund. Half of Angolan residents get by on less than $1.25/day. Congo – second most important produce of Coltan outside of Australia, also gold, tin, tungsten and diamonds. Residents live on less than $1.00/day. Nigeria – oil and gas. Cotton/textile industry that flourished in 1980s shut down (causing mass unemployment) by continuous flood of smuggled Chinese counterfeit textiles. Sam Pa and the French oil company Total have teamed up to challenge Shell’s longstanding monopoly on Nigerian oil. South Africa – rich gold, diamond and platinum exports financed the creation of the apartheid state, in which a tiny white minority controlled the entire economy. Since the fall of apartheid in 1994, this minority has been joined by a handful of Black entrepreneurs. Botswana – diamonds. Somewhat protected from “Dutch curse” by the creation of value added industries that cut and polish their diamonds prior to export. Guinea – among world’s richest reserves of iron and aluminum. Bought out by Sam Pa as a result of Western sanctions. Ghana – gold. Financed by Chinese Investment Fund after IMF tried to impose structural adjustment conditions** to refinance a World Bank Loan. Zimbabwe – diamonds, platinum, nickel, gold. Mugabe used revenues from export industries to finance particularly brutal security force. Diamond industry bought out by Queensway as direct result of Western sanctions. *Coltan is a rare precious metal in high demand for cellphones and laptops. **IMF structural adjustment conditions typically require debtor companies to privatize state owned industries, legislate deep cuts in social services and accept extensive foreign investment as a condition of receiving World Bank loans. Africa is a 1984 documentary exploring the great civilizations of Africa. In it, late historian Basil Davidson demolishes the myths Europeans concocted about Africa to justify the 400 year slave trade – these myths concerning a continent of subhuman savages persist to the present day. Davidson reviews archeological evidence, ancient African and Europeans artwork and historical records and contemporary tribal traditions that survive from past civilizations. The documentary is divided into 8 episodes of approximately 25 minutes each. Episode 1 Different But Equal – studies the depiction of blacks in medieval and renaissance European paintings to show how the concept of race was created in the 16th century to justify the immensely profitable enslavement of human paintings. He starts with an examination of cave paintings that point to a highly advanced Saharan civilization prior to the Sahara’s desertification (around 7,000–8,000 years ago and the prominence of black-skinned the 3,000-year civilization Egypt enjoyed under the pharaohs. Episode 2 Mastering a Continent – focuses on Kushites and the great Nubian civilization to the south of Egypt. The latter converted to Christianity and persisted until the 11th century when it was destroyed (by Saracens) during the Crusades. Episode 3 Caravans of Gold – discusses the vast commercial trade network (extending as far as India) centered in Timbuktu (Mali) and the Ashanti civilization (in modern day Ghana). In the 14th century, Mali converted to Islam. Under the guidance of Muslim scholars, Timbuktu became a global center of Islamic scholarship in law, literature and science. Episode 4 The King and the City Within – describes the civilizations of Huaser, Benin and Ethe in modern day Nigeria. Episode 5 The Bible and the Gun – covers the arrival of the Europeans and the devastating of slavery on long established African civilizations. Over 400 years, the African continent lost approximately 15 million skilled craftsmen and farmers. As the slave trade declined in the 18th and 19th century, Europeans opened up Africa’s interior in order to exploit its rich natural resources. As in Latin American and Asia, Christian missionaries played a fundamental role in this process. Episode 6 The Magnificent African Cake – gives an overview of the extensive European military campaigns that flattened African resistance to colonization. By 1914, Liberia and Ethiopia were the only two countries not under European military control. Episode 7 The Rise of Nationalism – relates how forced conscription in World War I and World War II radically changed Africans’ view of Europeans and fueled demands for independence. The Gold Coast (later renamed Ghana by President Dr Kwame Nkrumah) would launch the first independence struggle in 1945. Davidson contrasts this with the more bloody independence struggles in Kenya, Algeria and other countries with substantial(European) settler populations. Episode 8 Legacy – explores how the adoption of European-style Parliamentary systems proved disastrous for many African countries. Davidson blames this on the fact that Parliamentary government is based on a well established class divisions. It worked poorly in Africa owing to the continent’s historic tendency towards egalitarianism. The following presentation by Friends of the Congo Executive Director Maurice Carney provides an elegant but horrifying summary of the CIA’s 50-year assault on the Republic of Congo. The Congo has the distinct misfortune of having amazingly rich mineral resources (uranium, gold, diamonds, copper, cobalt and especially coltran*). The result has been a single minded determination by Wall Street and the CIA to destroy democratic rule in that country. I was well aware of the importance of CIA and US State Department in destabilizing Latin America, Asia, Russia and the Middle East. Until recently I was less aware of their aggressive machinations in Africa. According to Carney, their first president Patrice Lumumba became a high priority CIA target it due to joint efforts with Kwame Nkrumah of Ghana to establish a United States of Africa. This presumably would have granted the continent total independence of US corporate rule. After briefly summarizing the county’s ruthless colonization by Belgium, Carney describes the Congo’s struggle for independence under Patrice Lumumba in 1960, the first and only legitimately elected president. After assassinating Lumumba, the CIA installed a 30 year dictatorship to ensure US corporations continued access to Congo’s resources on their terms. In 1996, the people of Congo had just overthrown the dictatorship and installed democratic government when the CIA instigated puppet sociopaths ( Paul Kagami of Rwanda and Yoweri Museveni of Uganda) to invade and instigate a 20 year civil war in Congo. In addition to providing them military aid and training, the US government actively covers up Kagami and Museveni’s war crimes, resulting in millions of civilian deaths. Current Congo president Joseph Kabila, also handpicked by the CIA, who succeeded his father Laurent-Désiré Kabila (1997-2001), maintains power by way of a US-rigged election in 2006 and massive electoral fraud in 2011. *Coltran is a rare earth mineral essential in the manufacture of cellphones and computers.